Apple CEO Steve Jobs explains the pinch zoom gesture to the Macworld audience at the January 2007 iPhone introduction in San Francisco. PatentlyApple has uncovered a bunch of multitouch related patents from Apple recently published by the US Patent and Trademark Office. 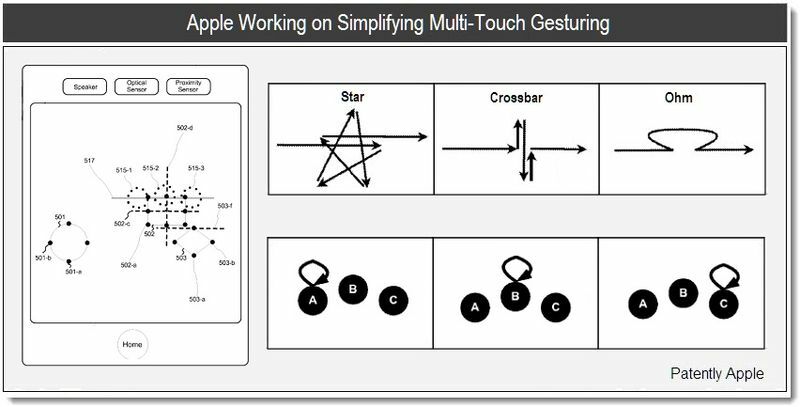 First of all, Apple has been awarded key patents related to multitouch gesturing on both mobile devices and desktops. More interesting than that is the news that the company is thinking how to simplify multitouch gestures in order to make them more natural and memorable. It involves a little help from input devices like the Magic Trackpad and notable gesture modification motions, mid-drag gestures and microgestures within gestures that would make possible new user interface enhancements, such as a Spaces-like feature for iPad envisioned in another Apple patent. The documents describe a bunch of new gestures with excruciating detail. New finger moves come with crazy names, like Ohm and Wiggle (multiple short movements with sharp changes in an arbitrary direction). They involve drawing familiar shapes with your finger, like stars, arrows, circle, crossbar, the infinity sign and other. In the big picture, Apple states that their newly proposed methods and interfaces will reduce the cognitive burden on a user while saving battery life. If we’re lucky, we may even get to see some of these new gestures playing out in various demo’s at this year’s WWDC keynote. And because mid-drag gestures allow for faster use of user interfaces, they consequentially conserve power, too. Apple was toying with new multitasking gestures (swipe to switch running apps, claw for the multitasking bar) in the first iOS 4 beta only to scrap them in subsequent betas. Registered developers can still unlock multitasking gestures by marking their iPad “for development” using the SDK tools. There are also unsanctioned apps for jailbroken devices that unlock new gestures. The fact Apple left the door open is a clear signal that new ways of interaction are being worked on, they’re just nor ready for prime time yet. It’s just not something you wanna rush out because multitouch gestures – once remembered – stick into mind and therefore should be carefully conceived like it was second nature for users.